The scattered X-Factor take stock of the alien world. With the Celestial descending rapidly above him, Cyclops realizes he has only one chance to survive, and blasts the ground beneath him. Elsewhere, Beast travels with the Rejects to their spired city, playing along with the idea that his memories were damaged by a Jammer attack to explain his lack of knowledge about the war. In the Chosen city, Lord Rask displays a captive Archangel to Lord Palik and Princess Seeraa. Archangel freaks free of his bonds, but is felled by Rask, though Seera finds Archangel magnificent. 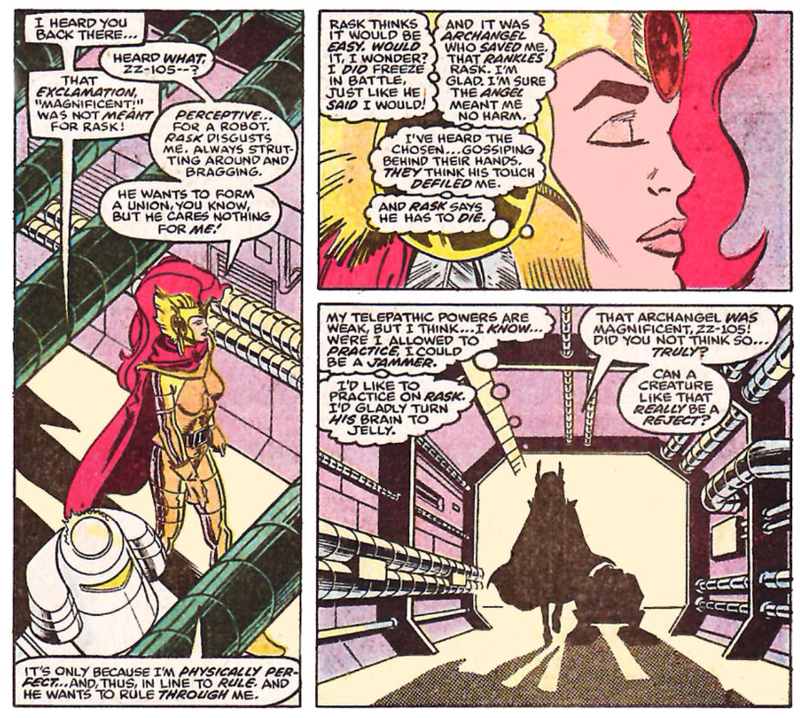 As Seera returns to her rooms, accompained by her robot companion ZeeZee, she walks past a lab where a scientist is examining Iceman. With no memory of who or what he is, the Dualer Lev is given responsibility for his re-orientation and good behavior. Elsewhere, the Celestial gone, Cyclops blasts free of the ground, having created a depression to protect himself. He is found by Zalph, a Beginagain to wishes to see the war end. 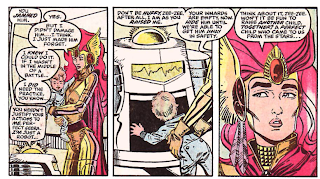 In the Chosen city, Seera comes across a solider carrying Christopher, and offers to return the baby to the scientists in exchange for some mood-minders, then telepathically wipes his memory of the baby, deciding to keep him for herself. 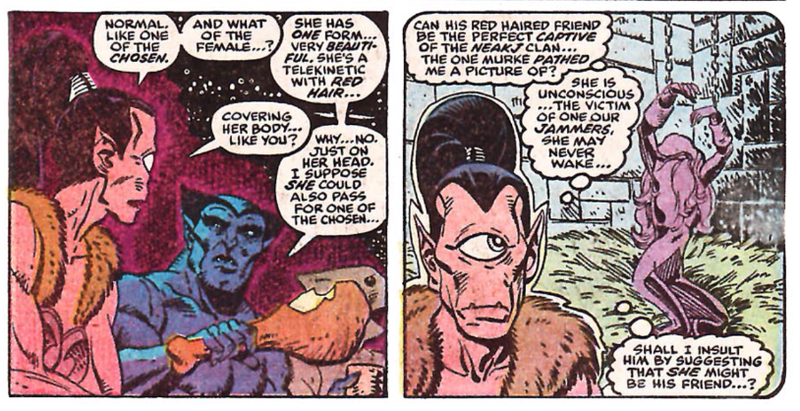 Amongst the Rejects, Beast tells their leader, Zarkah, of his friends, but she is reluctant to tell him of the red-headed female captive of another clan. In orbit around the planet, Ship insists to the Celestial holding it captive that he has told all he knows, but realizes Apocalypse's tale of Ship's origin rings false. 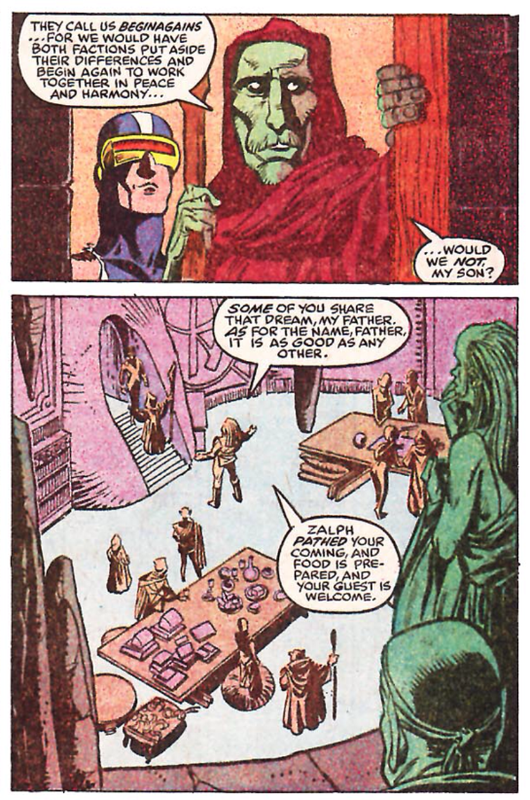 On the planet, Cyclops is taken to the Begingain home, where Zalph tells Cyclops of how their mind-travelers have discovered mention of saviors from the stars in their ancient tales, and that the Celestials have returned to judge the planet for a fifth time. If they fail, their world will be destroyed. 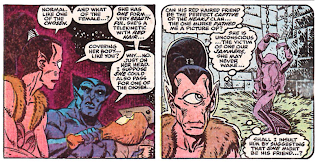 We learn this issue that the Chosen princess Archangel rescued last issue is named Seera and she is telepathic, and that the one-eyed Reject who befriended Beast is named Zarkah. We're also introduced to a few new characters, a Chosen named Lord Palik, and ZZ-105, Seera's attendant droid, a mix of R2-D2 (in form) and C-3PO (in personality). 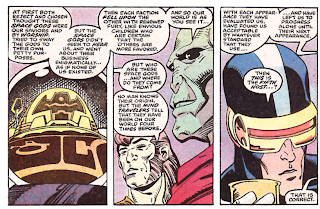 This issue also introduces a third faction, the Beginagains, a group comprised of Rejects and Chosen who want to end the war via compromise. 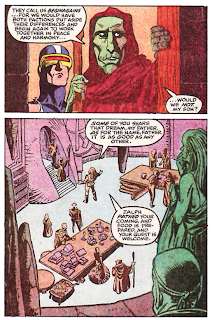 Cyclops falls in with them after surviving the Celestial landing, and learns from them that the planet has worshiped the Celestials as gods, and that four times prior to this the Celestials have come to judge the world and found it worthy of continuing on. Now the Fifth Host is at hand, and the Beginagains fear the Celestials will judge the warring Chosen and Rejects poorly. All of which is where the story gets it title. Beast says that Archangel looks perfectly normal, if you ignore the blue skin, racing stripes and wings, a further suggestion that his costume is actually his skin. It's revealed that Seera is considered the Most Perfect amongst the Chosen, and is thus inherently the most politically powerful, while Lord Rask wants to establish a union between himself and Seera to boost his own power. While the Chosen reproduce via science, Seera has been told forbidden old stories by ZeeZee about a time when that wasn't always the case. The Chosen also regulate their moods via a variety of drugs. Christopher, who is considered a perfect child by the Chosen, ends up in the possession of Seera when she trades the solider who pulled him from the battlefield some drugs for him. And maybe it's just the expectant father in me, but while I'm willing to suspend my disbelief that Christopher isn't screaming his head off at this point, I find it less likely he'd just quietly sit inside the dark belly of a robot. 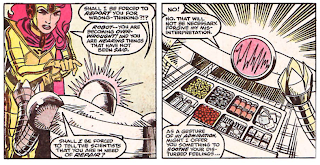 In one brief panel, we see that Marvel Girl is an unconscious prisoner of a Reject clan. 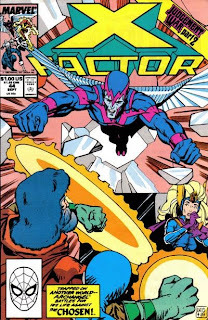 After dropping X-Factor into the middle of an alien war last issue, this one deliberately slows down in order to further explore this new world, flesh out the new characters, and establish X-Factor's relative positions within the story. 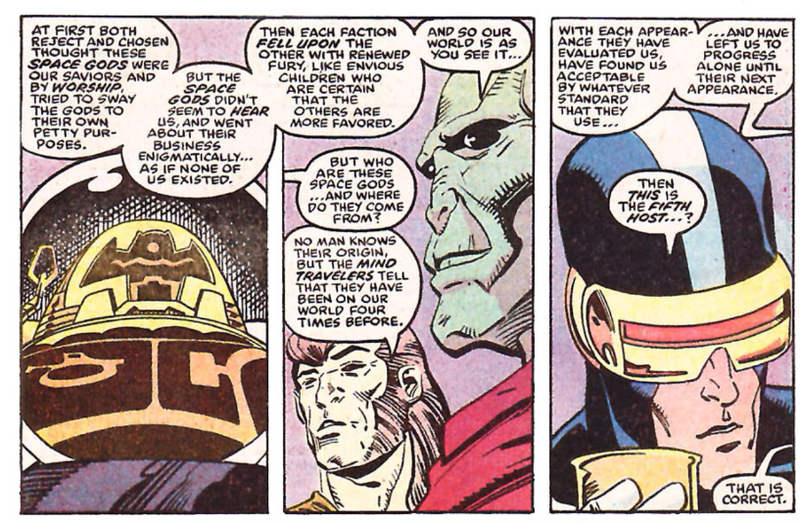 It's essentially a down and dirty bit of world building, as X-Factor itself is mostly sidelined in favor of exploring the world, and Simonson does an effective job building on what was introduced last issue, taking the notion of the untouchable Chosen even further into their sterile, drug-addled city compared to the lower tech and more primitive Rejects, while adding in a third faction via the Beginagains. In addition to character and world building, we also get a hint at the planet's religion, which helps keep the overarching plot of the story from fading too far into the background. It's definitely a slow burn compared to last issue, but it's doing necessary work. If we're going to spend eight months on this world for this story, we need a good sense of how its societies work and the people therein; this issue goes a long way towards that goal. Next week, Excalibur #12, Wolverine #11 and Wolverine #12. She should rather aim to marry Lord Palik instead. "Seera Palik" is a name that has a tang of political trustworthiness in it, don't you think. Zarkah's descendant will one day get some fame for herself in Futurama. Other than crappy puns, I got nothing. This thing does not speak to me on any level. Didn't even know such a storyline existed. Let's hope the Celestials will ramp it up a bit in the following issues. On second reading, I think I lied a bit. I'm mildly intrigued by this continuous point-making of the Chosen sexless reproduction which according to stories wasn't always the case and of which the Perfect One seems to be slowly snapping out of. Where might they be taking us to? I'll resist the temptation to look it up at this point. Christopher sitting quietly in the robot's tummy, though. He's spent time in Mr. Sinister's cocoon so it's not like he shouldn't be used to it by now. 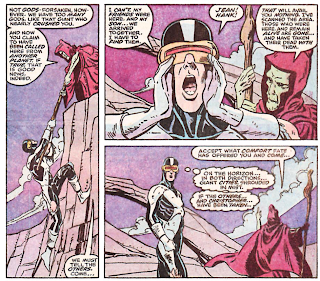 Just hanging there calmly sending nonchalantly out a telepathic distress signal has always been rewarded by action and thusly has been a winning formula this far. He'll also grow up one day to be really weird and hangs out a lot inside/with Graymalkin, a metallic shell with an AI then. Dark Belly of a Robot is my new band name. Industrial metal for mainly child audiences, right, Blam? @Teemu: Zarkah's descendant will one day get some fame for herself in Futurama. Let's hope the Celestials will ramp it up a bit in the following issues. Don't get too excited. If memory serves, the Celestials remaining a looming but mostly uninvolved presence in the story until the very end. Whoops! Forgot that I had an actual question/comment on the issue, which the Leela mention reminded me of: Is the giant orange alien, Old Vlon, seen atop the giant stone Arby's hat on Pg. 6 of the story supposed to be a large, musclebound S'ym-like homage to ALF? The fact that he's mentioned the way he is makes me feel like he plays a part in the story later, not that I care much either way. I think this series would be a better read if 1) it was a few issues shorter and 2) someone...better was inking Paul Smith's work. 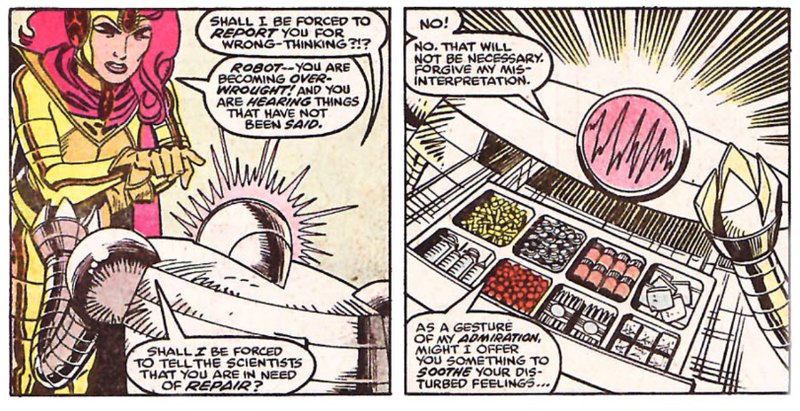 With everything that has happened to him so far (demons, goblins, The Marauders, his own psycho mother, Mr. Sinister, etc), I doubt Baby Cable is even all that bothered by being put inside a robot. @Blam: The fact that he's mentioned the way he is makes me feel like he plays a part in the story later, not that I care much either way. If memory serves, he does play a part later in the story (as his introduction here clearly suggests). Whether the Alf homage was intentional or not, I have no idea. @wwk5d: With everything that has happened to him so far ... 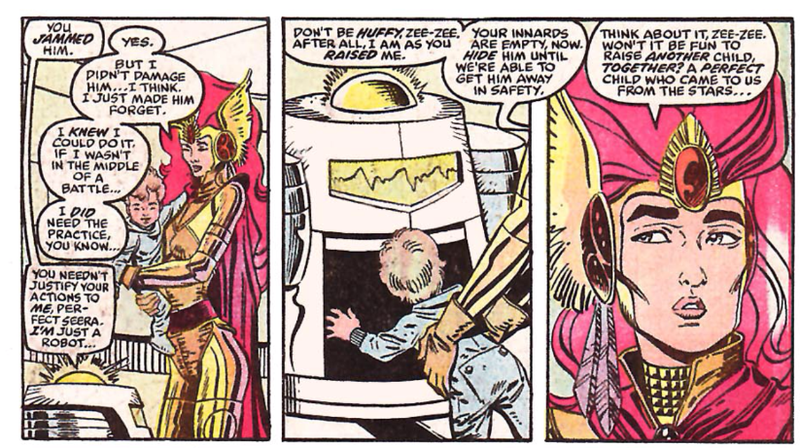 I doubt Baby Cable is even all that bothered by being put inside a robot.